We have a new member! Please help me welcome Shay who is joining us from Texas. You can see what Shay is all about by dropping by her blog Patchwork Anvil. Shay will begin swapping with the November swap. Thank you very much! I'm looking forward to it - another reason to be out in the studio working! Welcome Shay!! You will love it here!! 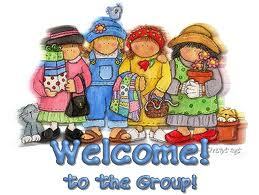 Welcome Shay....I am new to the swap too, just sent my second block....I love it!!! Christa's Sept Buzzard Block ~ Sneek Preview!